An iconic North-east establishment has officially opened its doors following a three-month refurbishment. 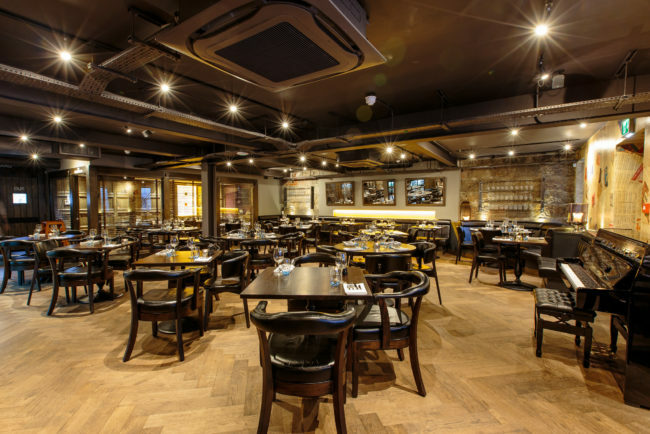 No.10 Bar & Restaurant, located in the heart of Aberdeen’s West End, has reopened after undergoing a significant transformation expanding into its neighbouring building to create a new 90-seater restaurant for the area. The new-look No.10 Bar & Restaurant, designed by award-winning architects, Nicoll Russell Studios, offers a relaxed yet sophisticated dining experience with stylish surroundings and is complemented by a versatile menu created by head chef, Andy Stephen, offering fresh, seasonal and locally sourced produce. The venue’s much-loved bar area has also been redeveloped with a new illumined gantry to showcase its wide range of whiskies, spirits and real ales. The restaurant also boasts a glass-fronted private dining room for up to 14 people, which can be used for private celebrations or corporate events. Director of No.10 Bar & Restaurant, Allan Henderson, said: “We are extremely delighted to formally open the new and improved No.10 Bar & Restaurant to the public. The venue was first launched in 1986 so it has a long history in Aberdeen and a loyal base of customers but we felt it had the potential to offer the city more with its prime location. “Throughout the renovations, we worked hard to retain as much of the venue’s charm and character and we feel we have created a fantastic venue that caters for a wide audience. Our new restaurant has an elegant yet understated style of dining, and the bar is great place to enjoy a drink with friends so it appeals to our regulars whilst also widening our appeal to new customers. No.10 Bar & Restaurant, based at 10 Queens Terrace, is now open for bookings. Please visit www.no10aberdeen.co.uk for more information.